Charging your gaming console’s controller is not a problem at all. 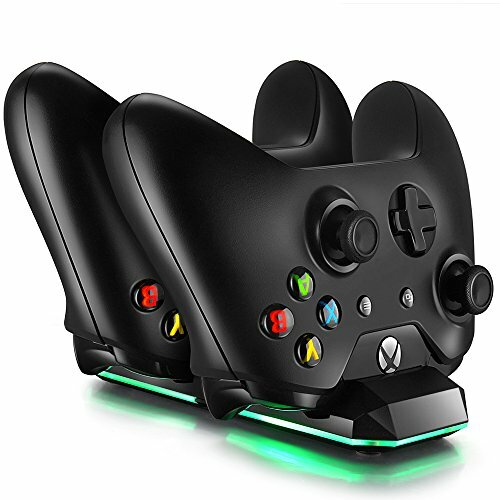 Just take a look at this list of best Dual Charging Docks For Xbox One and Xbox One S Controllers and choose the one for a comfortable dock. Charging your Xbox One or Xbox One S’s controller is enough easy job for a good charging dock, but finding one of them good is not that easy task. So, here we are bringing a list of the best Dual Charging Docks For Xbox One and Xbox One S Controller. This will make your charging issue look less from now on. We have taken care of the looks and compact design, so you get little flexibility while selecting the best charging docks for your gaming console’s controller. Let us start this exclusive list of dual charging dock with one of the best seller product on Amazon. 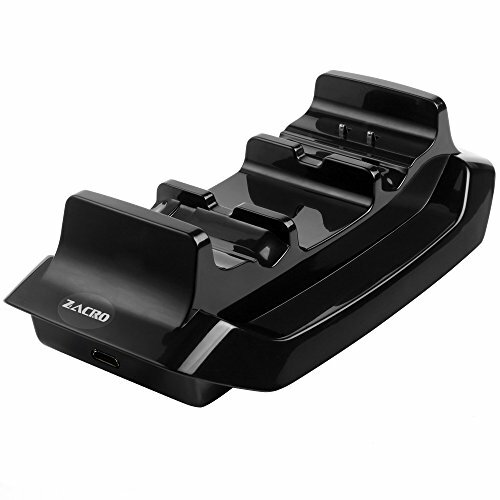 The dual charging dock from Zacro featured with two rechargeable 600 mAh batteries and 1 USB charging cable. 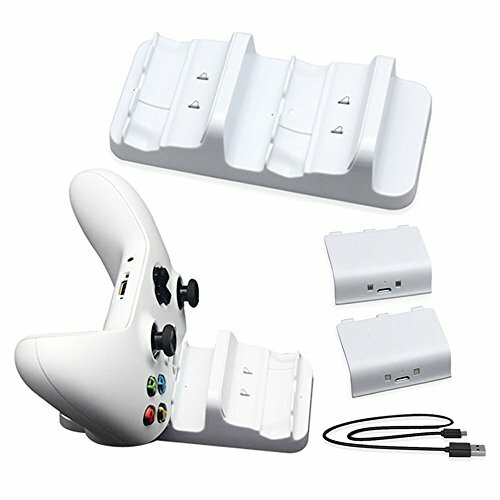 It even charges the controller very fast and protects the controller from over-charging. It has LED indicators that turn to white while the controllers are fully charged. Designed to charge two gaming controller at the same time. Secures from over-charge and circuitry. Cradle design for safe and convenient charging. Two rechargeable batteries of 600 mAh power. User-friendly charging cable to play and charge up the controller. It is affordable and works excellently. Once have this charging dock and forget about batteries. The execution is quite poor. Sometimes charging of controllers can be iffy. Fosmon is another great product on world’s best store Amazon. This dual charging dock includes two 800 mAh batteries with a lifespan of over 1,000 charge cycle. Once the controllers are completely charged, you can have 25-28 hours of play time because of the long lasting rechargeable batteries. It has inbuilt LED indicator for charging status. Includes two battery packs of 800mAh power. The lifespan of the battery is over 1000 charge cycles. After charging controller provides 25-28 hours play time. Built in LED indicator for charging status. Takes only two hours to charge the controller. Outstanding customer service from the brand. Easier to use as well. Doesn’t equipped with auto shut off while the controllers are completely charged. CBSKY charging station is unique from all the docking station. This dock station doesn’t equip with rechargeable batteries. It uses charging station, is powered by USB port of Xbox One game or computer or any other power adapter. A single controller can be fully charged within two hours, but it takes four hours to charge two controllers at a time. Compatible with XBOX One and XBOX One S console. It uses charging cable to charge controllers. 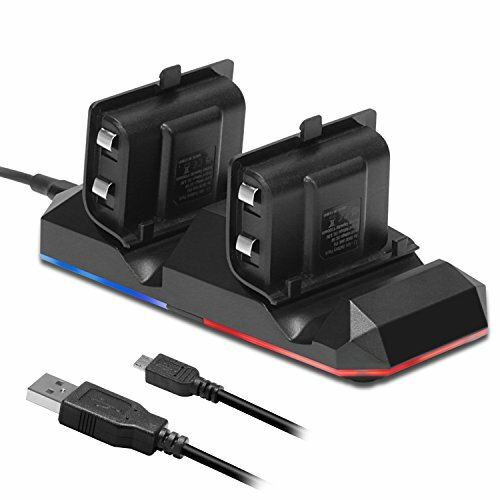 Dual port charging dock charges both the controller at the same time. Takes two hours to charge one controller and four hours to charge two controllers. 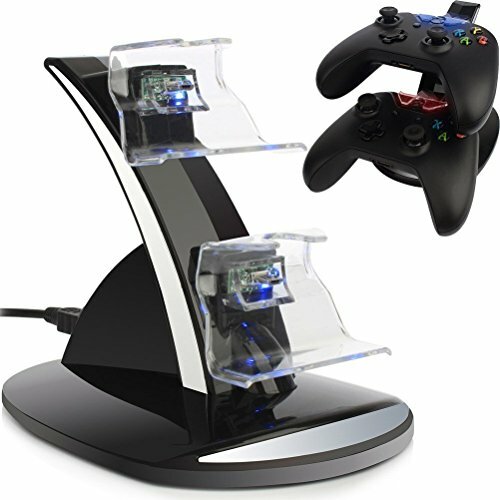 Here comes the user-friendly designed docking station that is convenient to charge two controllers simultaneously. There is no need to remove the battery while charging. With this docking station, you will have one dual-charger, one charging cable and two batteries with the 300 mAh. This dock station is made of ABS material, and it supports input voltage DC 5V, output voltage DC 2.4V and charging current 300 mAh. Compatible with Xbox One and Xbox One S controller. No battery require while charging. Takes power from USB port of Xbox One S or computer. Supports two batteries of 300 mAh. Supports input voltage CD 5V and output voltage DC 2.4V. It saves space of two gamepad controllers. It takes lesser time to charge. Let you play for extended time. The ICESPRING offers very compact designed dock station that comes along with the charging status indicators. It is light in weight and portable too that includes USB charging cable and two rechargeable batteries of 300 mAh. It charges your controllers from your laptop, USB AC adaptor or even directly from the Xbox One. Packed with two rechargeable batteries. Also, comes with charging cable. Both the batteries are about 300 mAh. Dual charging status indicators to show charging status of each controller. 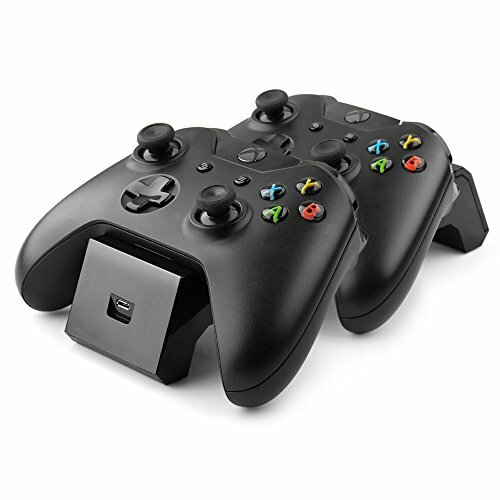 Charge controller from the laptop, USB AC adapter or directly from Xbox One. The controller doesn’t work for more than six hours. This dual charging dock comes along with LED charge indicator that even includes two rechargeable batteries with the capacity of 600 mAh. To charge the gaming controllers just drop them on to this dock to start charging there is no need to find the micro USB ports. 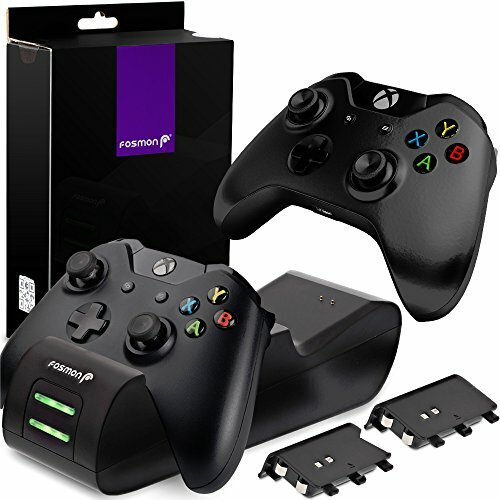 You can charge them from your PC, laptop, USB AC adapter, or directly from your Xbox One S.
Apart from Xbox One and Xbox One S, it charges Xbox Elite controller. LED charge indicator for a single controller. Single-chip that control the charge and make it stable. Packed with two rechargeable battery. The capacity of the battery is 600 mAh. Equipped with drop and charge design. Works just like a charm. The design is quite low-profile. The last one is precisely intended to charge the controllers of Xbox One, Xbox One S and Xbox One Elite controller. It takes a short time for charging while giving the long time to play. It can charge the controllers just in two hours and give up to 11 hours to play. It equipped with LED light indicator to show charging status. It comes with two rechargeable batteries with the capacity of 1100mAh and one USB cable that lets the controller charge while still being used. It even protects the controller from over charging them. The brand offers 100% satisfaction warranty. Design specially for Xbox One, Xbox One S and Xbox Elite as well. Charges two controllers at the same time. Takes two hours to charge and 11 hours of play time. The LED light indicator for charging status. A capacity of batteries is 1100mAh. 90 days full payment and refund warranty. Looks great at the desk. Well, these are few of best suggestions for the Dual Charging Docks For Xbox One and Xbox One S Controller. Which one is your best pick? Share your experience here with us.